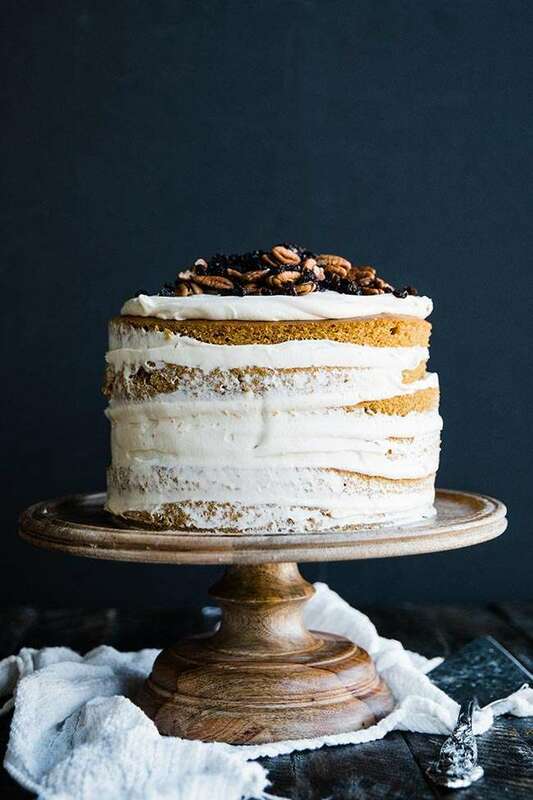 Layered Rum Pumpkin Cake Recipe with Maple Cream Cheese Frosting: A delicious layered pumpkin cake recipe with rum that is served up with a sweet maple cream cheese frosting! Bro, it’s October which means we are bout to go into full pumpkin mode. Seriously everything is pumpkin, whether it’s cookies, muffins, or our coffee pumpkin takes over. Instead of being a grouch like last year, see this video, I’m going to hop on board and make up a super tasty layered rum pumpkin cake recipe and then I’m going to top it off with a maple cream cheese frosting, pecans and currants! Yeah dude, it’s good! In light of this pumpkin layer cake recipe video, I’m collaborating with one of my all-time favorite Youtuber’s ever, Entertaining with Beth. You won’t find a more down to earth, nicer, more talented person than Beth, no joke! She is a great cook and I’m super proud to call her friend. So, when you are done with this video, or heck even before, go see her amazing recipe video for pumpkin spiced waffles which will for sure help you start off your day right, In October! I don’t know why I get so annoyed over pumpkin stuff, but I just do. I think it’s because it really starts creeping up in September and it literally runs through the rest of the year. It’s not just an October thing any more it’s an entire fall into winter thing. I know, I need to get over it and I finally believe I am, which is why I’m making this pumpkin cake recipe! When it comes to making a pumpkin cake, there are so many different ways you can do it. You can do it in a prepared cake pan, shallow or deep, on a sheet try, which is what I did, or heck even as a thin 1-layer cake. Really what I am getting at is I know sometimes my recipes are nuts, so I don’t want you to think you have to make this big ol recipe at home because there are a lot of extra pieces of cake and icing leftover. In the end my Italianess won’t let me cook food for less than 20 people even if I’m only feeding 3! It’s a problem I know lol. This pumpkin cake recipe is super good and really easy to make. It’s as simple as combining your wet ingredients with your sugars and pumpkin and mixing everything together until combined. Once they are you mix together all your dry in a separate bowl and then slowly adding it in to the wet ingredients until combined. From there you can use this pumpkin cake recipe into cupcake molds, into prepared cake pans or on sheet trays. Bake up this pumpkin layer cake and then it’s time to make the cream cheese frosting. I’m not sure what it is but something magical happens when you combine cream cheese frosting with pumpkin cake. The marriage between these two things is seriously insanely delicious and one of my favorite things to eat, which is probably why I made so much. When it comes to making a cream cheese frosting you’ll still actually use some butter as well just to cut it a bit. It’s really like a cream cheese butter cream frosting, but who cares what you call it because it’s delicious! You want to whip the butter and cream cheese together until it is smooth and creamy and then you add in the powdered sugar and maple syrup and whip it some more. The goal is to get everything combined while ensuring the frosting is completely smooth. If you’ve got chunks in your frosting, then you haven’t beaten it enough. To help minimize these chunks be sure to remove the cream cheese and butter from the fridge about 2 hours before you start making this recipe. I just find that softened fats mix much easier and better. Well you guys that’s all I got for now, just go make this cake because golly is it good. Also be sure to check out my friend Beth’s video and remember to subscribe to her channel and follow her on all social channels, you will not regret it! 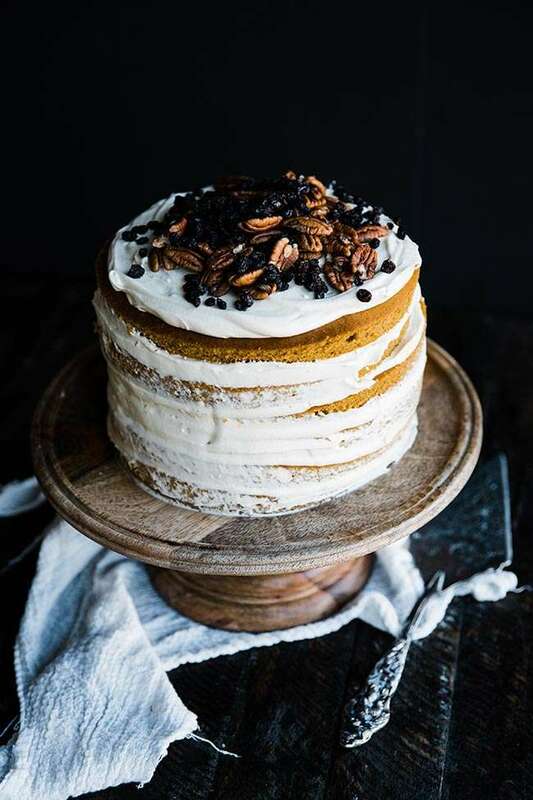 A delicious layered pumpkin cake recipe with rum that is served up with a sweet maple cream cheese frosting! In a standing mixer with the whisk attachment on low speed mix together the eggs, melted butter, sugars and pumpkin until combined. In a separate large bowl whisk together the flour, baking soda, baking powder, salt and seasoning blend. Next, evenly distribute the batter onto 3 cookie sheet trays lined with parchment paper and sprayed with non-stick spray and bake in the oven on 350° for 15-18 minutes. Let completely cool before icing. In a standing mixer with the paddle attachment, cream together the cream cheese and softened butter until it becomes light and fluffy. Add in the powdered sugar, and syrup, and whip until incorporated and smooth. Once the cakes have cooled use an 8” cake cutter to make 6 layers. Ice in between each layer with the cream cheese frosting and top off with pecans and currants. Note: There will be lots of leftover pumpkin cake pieces as well as icing which is perfect for making trifles in a glass or just mixed together and eaten. This is one beautiful cake! I agree with you that something magical happens when you combine pumpkin cake with cream cheese frosting. Definitely my favorite way to eat pumpkin! Wow! This is stunning and sounds SO delicious! I love the combination of ingredients / flavors. Perfection!! This looks SO pretty! This cake is definitely a show stopper! This cake looks absolutely delicious! Yummy! Craving for this! That is one gorgeous cake and so perfect for fall!